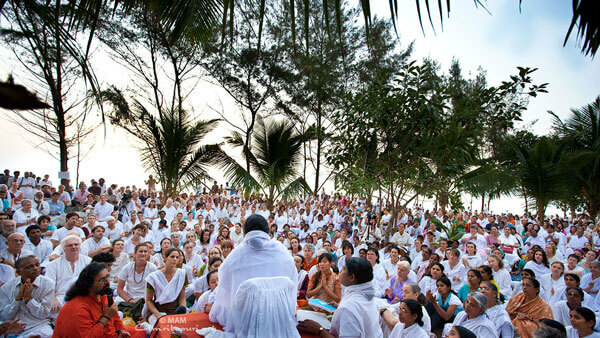 During a question-and-answer session in Amritapuri, Amma was asked about the best way to chant one’s mantra. QUESTION: Amma, I like to chant my mantra aloud. I feel a lot of love and devotion and enthusiasm when I do that. But when I do the same by just moving my lips (without any external sound), I don’t get the same amount of concentration and I don’t feel the same amount of love and enthusiasm. Since you are my Guru, I would like to guide me as to which is the best way to chant my mantra. Amma: “When we chant slokas (hymns or prayers), we can surely chant them aloud there is no harm in it. But when we are chanting mantras that have bijaksharas (seed sound syllables), then it is advised not to chant such mantras aloud. It is better to chant such mantras by merely moving the lips (with no external sound). “Suppose you are alone at home, then you can surely chant your mantra aloud. There is no harm in it. Or you can close your prayer room and chant it aloud. Suppose you are living alone, and there is nobody else listening to you, then also, you can chant the mantra aloud. For some people, that may give more concentration. Some students love to read their lessons aloud, whereas some like to read it silently without making any sound. Some get better concentration when they read it silently. It varies from person to person. In general, if there are people around you, then it is better to chant the mantra by just moving your lips in the initial stages [later, one will not find it necessary to move the lips but can just chant the mantra inwardly]. “In olden days, the Guru wouldn’t give mantra initiation so easily. They would go by Adhikari-bheda before initiating them into a mantra. That is, they would see if the disciple was prepared to take up the practice of mantra japa. Some children have a talent for singing from a very young age. Once they are trained by a music teacher, they can easily become an accomplished singer. But with Amma, when it comes to mantra initiation, she has never looked into the adhikari bheda – otherwise none of us would be here in the ashram [everyone laughs]. 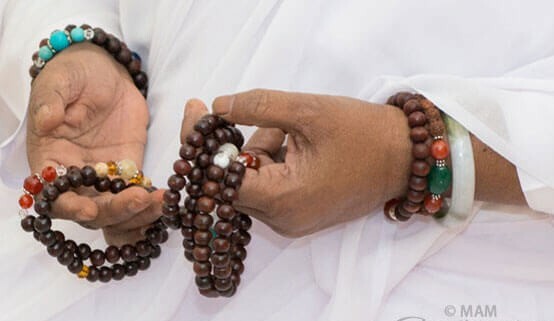 Amma gives mantra initiation to whoever asks for it, with the hope that at least that person will chant this mantra for some time, if not forever. In that way, there will be at least some benefit. That is all Amma cares for. “When Amma gives a mantra which has a bijakshara, then there are certain instructions that need to be followed along with it. A mantra with a bijakshara has to be heard from the Guru’s mouth directly. One has to be initiated by the Guru. That is what in fact brings about a change, a transformation in the disciple. “Here (in India), a little of yogurt is added into milk at night, and by morning the milk becomes fermented and is transformed into yogurt. Similarly, when you get a mantra from a Guru, it is like adding yogurt into normal milk. When you don’t get it from the Guru and you try to do it on your own, then it is like milk converting into yogurt by adding some other materials for fermentation; in such cases, the quality of the yogurt may be less. “We all have the Truth in us, but we are not able to see it because our minds are contaminated. When we say, “water is hot,” the heat can be of various degrees. It can be 10 degrees, 20 degrees, 30 degrees, or even 100 degrees boiling water. In 10 degrees, the micro-organisms may still be active, but as the temperature increases, the amount of micro-organisms decreases. A real Guru is completely pure, 100% pure, and thus whatever comes from Him has the power to create a transformation in the disciple as well. When a Satguru gives a mantra, he or she is infusing his/her energy into us, and that can create a change from within us. “In the initial stages of our sadhana (spiritual practices), we feel a lot of enthusiasm. At the same time there are certain do’s and don’t’s which we need to follow, so that we are able to stay focused on the spiritual path. Let us say you are the owner of a new vehicle and you start driving it. Initially you may not be able to drive it in high speed because there is a speed lock. Only after driving it for a given amount of kilometres can you really take it to a higher speed. If you have a mixi (grinding machine used in kitchen), and you continuously keep the mixi on, the motor is going to burn out. You have to switch off the mixi once in a while, so that the coil of the mixi is not burnt. Those who have the understanding of spirituality, who have read spiritual books and have proper guidance – such people know about all the precautions to be taken, but others surely should not go too overboard without taking the right precautions. A health tonic has a certain prescribed dosage beyond which it can be quite harmful, and the dosage is different for children and different for adults. If you gulp down the whole bottle of tonic thinking it is tasty, then instead of doing good it will only cause you harm. Similarly, when doing spiritual practices like meditation, you may be very enthusiastic about it, and you may think, “Let me meditate for hours together.” Now, if you are not really ready to meditate for hours together, then doing so can lead to many problems. Your head can get heated, you may not get proper sleep, your digestion can be affected, etc. For some people, such uncontrolled spiritual practices can even lead to depression and similar unhealthy conditions. So one must approach meditation in a very progressive way – slowly and steadily. “One should increase practices little by little, and not do too much straight away. In the initial phases, it is good to meditate for 20 minutes or for half an hour. Once you are comfortable with it, then you can consider increasing it slowly. One should not force the mind into meditation for hours together . It has to be done gradually. When we start doing our practices, it is important to have the right guidance. Those who don’t have samskara (spiritual culture) absolutely need this guidance from a Guru. It is like a student doing practicum in the laboratory. The student needs to have the professor nearby, instructing the student on how to use the chemicals, how to conduct the experiment in the right way, and what the precautions are that need to be taken. The Guru guides us as to what should not be done initially, and what can be done in the initial stages. The Satguru knows what is the best for the disciple and advises each one accordingly. Peace, peace and peace be everywhere! The sloka is an invocation for harmony and blessings for all of creation. In ancient days the social structure and form of government differed from ours in many ways, that is why we need not take the literal meaning of this sloka, but the essence. For peace and harmony to prevail, the kings–i.e. the politicians and leaders–should have a healthy approach towards their subjects and govern according to principles of dharma. This, we sadly note, is very rare indeed in today’s world where power and wealth seem to be the prime motivation for the ruling elite. Nevertheless, the ideal remains as it is, and as Amma’s teachings are personally influencing countless politicians all over the world, there might yet be light at the end of the tunnel. Brahmin is one who has either realised his oneness with Brahman, the Absolute, or one who has dedicted his life to the pursuit of that realization. Such selfless people are the enlightened thinkers who provide society with a healthy understanding of life. They give guidance to all sections of society, including the political leadership. A Brahmin can also mean a brilliant intellectual who is using his talents to selflessly serve society. Thus for a stable and bright society, it is essential that these Brahmins are healthy. The sage who gave voice to this mantra obviously does not assert Brahmin-hood as a hereditary vocation as found today. There are many examples in history to demonstrate that Brahmin-hood is an inner quality not dependent on the social status that prevails upon one’s birth. We need only to look back to the great sage Veda Vyasa, also known as Krishna Dvaipayana because he had a dark complexion and was born on an island. He was born to a fisherwoman but possessed one of the greatest minds of all times and is universally accepted as a great rishi. He codified the Vedas and composed original works that are famed all over the world for their exquisite spiritual content. Among them are popular works like the Mahabharata and Srimad Bhagavatam, as well as profound treatises on the Ultimate Reality like the Brahma Sutras. In spite of his humble origins, Sage Vyasa is one of the most revered among the plethora of India’s spiritual giants. Amma was born in a community of fisher folk. She was educated only up until the fourth standard and speaks only her mother tongue. Also, most striking of all, she has never studied the scriptures. Yet their wisdom flows from her lips unceasingly, rendering the most abstract truths in simple ways that most anyone can understand. Who would then deny Amma’s Brahmin-hood? Amma is directing the world with her wisdom, speaking to large audiences throughout the world, even at the United Nations. In today’s society, such a prayer, if taken literally, has also a special irony, for cattle ranches around the world have become breeding grounds for diseases like the mad-cow epidemic. When cattle and the rest of the animal kingdom are devoid of well being, humanity will also suffer. Thus harmony between humans and the rest of creation is also stressed in this prayer. Actually cow can be taken as representative of the entire animal kingdom. The Sanskrit word for cattle is “go,” which is a most profound Vedic symbol and has many subtle spiritual meanings. Two such secondary meanings are “earth” and “mother,” and as such the sloka could also be a prayer for the welfare of Mother Earth. So we need not be worried that God will send a herd of cattle charging through our living room when we pray thus. The most important aspect of the mantra is that the sage does not pray only for his clan or nation but for the whole world or, more precisely, all the worlds2. This, as Amma tells us and shows us, is the correct way to pray. Instead of asking for something for our self, Amma advises us to pray for the whole creation. Praying for the welfare of all sentient beings–all humans, all animals, all plants—our mind becomes more expansive. Through such prayer we slowly can go beyond our limited egocentric concepts of self to identify with the entire creation, recognising its true nature to be none other than our own. And as we too are part of the world, we also are benefited from the blessings of the prayer. Amma’s whole life is a constant endeavour to bring happiness to as many beings as possible. Her life verily is this prayer in action. She is showing us the correct attitude by which not only to pray but also by which to live. While chanting Om lokah samastah sukhino bhavantu next time, let us try to feel deeply for all living beings, and make a resolve to live in this selfless spirit. 1 Many of the original 1008 branches of the Vedas have been lost. It is possible that this mantra was in one of those lost branches. If not, it surely took birth from or around a Realized Master. 2 According to the traditional view, there are 14 worlds, or planes of existence–six figuratively above us and seven figuratively below. Bhuh is the earthly plane. Above it in ascending order are Bhuvah, Svah, Mahar, Jana, Tapa and Satya (also known as Brahma-loka); below in descending order are Atala, Vitala, Satala, Rasaatala, Talaatala, Mahaatala and Patala. These are generally divided into three zones: heaven (svarga), earth (prithvi) and the netherworld (patala). That is why one frequently comes across the expressions in the scriptures like “the lord of the three worlds.” If one refuses to accept that there are 14 worlds, they can consider the reference to multiple worlds as meaning the infinite perspectives of this world, as percieved by all the animals, plants and humans. Amma’s whole life is a constant endeavour to bring happiness to as many beings as possible. Her life verily is this prayer in action. She is showing us the correct attitude by which not only to pray but also by which to live vedas. 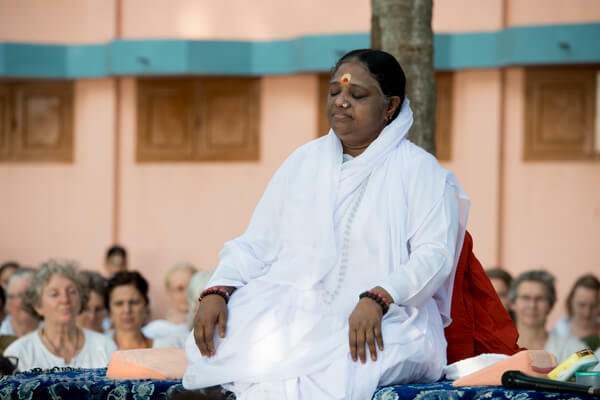 It is in this spirit that people throughout the world are regularly chanting these mantras, and in which they are chanted twice daily at Amma’s ashrams—both at the conclusion of the morning arcana and after the evening arati. The second line—tamaso ma jyotirgamaya—means “Lead me from darkness to light.” When the Vedas refer to darkness and light, they mean ignorance and knowledge, respectfully. This is so because ignorance, like darkness, obscures true understanding. And in the same way that the only remedy for darkness is light, the only remedy for ignorance is knowledge. The knowledge spoken of here is again the knowledge of one’s true nature. Currently, in the darkness of our ignorance, we believe ourselves to be bound and limited (otherwise we would not be reciting these mantras in the first place). But the Guru and the scriptures are telling us that, in truth, we are not, never will be and never have been bound. Eternally we sat-cit-ananda. The only thing that can remove our ignorance regarding our true nature is a spiritual education at the hands of a True Master like Amma. At the culmination of such an education, light floods the room, as it were; darkness vanishes. 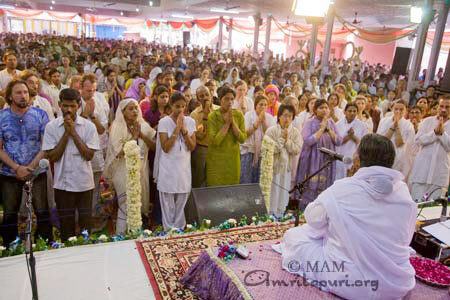 Once, when discussing these mantras, Amma said the first step in attaining the knowledge for which one is praying when they chant these mantras is satsang: listening to spiritual talks, reading spiritual books and being in the company of spiritual seekers and, of most importantly, spiritual masters. “We need to continuously be fed by the knowledge that our true nature is the Atma and not the body mind and intellect,” Amma said. Through satsang, our attachment to the asat gradually lessens. “Slowly as you understand that everything in the world—all worldly relationship, all worldly things—are ever-changing an impermanent, your attitude towards the world changes. We gain detachment.” As we become more and more detached, our desires also naturally decrease, because we know that the things of the world are impermanent and cannot bring us lasting happiness. As the desires decrease, the mind becomes less and less agitated. It obtains serenity, stillness, peace. Then, with this stilled, subtle, penetrating mind we can finally come to realize our true nature. all are places of misery wherein repeated birth and death take place O Arjuna. The human goal according Vedanta is Self-realization. The Atma is the ultimate reality. When one realizes his true nature, he attains spiritual fulfillment in this life itself. Then, upon death, he does not go to any heavenly abode but simply merges into the supreme reality. The mantras chanted in Amma’s ashrams at the end of arati and archana are called shanti mantras. Therefore to conclude each one, “shanti,” which means “peace,” is chanted three times. As a spiritual aspirant, one chants shanti in desire for the occurrence of circumstances conducive to a spiritual education. But these mantras can be chanted for peace in a general sense as well. Shanti is chanted thrice not for emphasis but because disturbances are of three distinct categories. In Sanskrit, these are referred to as adhi-daivikam, adhi-bhautikam and adhyatmikam. This silence is representative of true peace, the peace of an Enlightened One like Amma. For the spiritual seeker, peace is the goal. For an Enlightened One peace has been realized as his very nature. To have be have equipoise in every situation in life verily is realization. Ārati symbolizes surrender—the final relinquishment of the ego to God. Just as the camphor used in the ritual dissolves into nothingness, so too should the individual will merge in the divine will, so too should we make an offering of the only thing that is truly ours to give—the ego. Only when we give up our erroneous concepts of “I” and “mine” will our worship truly be complete and will we receive the ultimate prasād—the awakening of divine love in our heart. [Om. Victory! Victory! Prostrations to the Jagad Janani, the embodiment of immortal bliss. Auspicious ārati to Mātā Bhavāni, Amrtānandamayi. The ārati is begun with the chanting of Om. Om is Brahman, the Absolute, pure consciousness that is everyone’s true nature. The song next proclaims Amma’s victory and offers prostrations at her feet. Amma’s victory is the victory of every Satguru—the victory of true knowledge over ignorance. Just as in the presence of sunlight, darkness stands no chance, so too for one who has surrendered at the feet of a Satguru the days of Self-ignorance are numbered. This victory is also the victory of dharma [righteousness] over adharma [unrighteousness], as Amma is redirecting the course of the world, leading mankind back to the path of truth, compassion, selflessness and other noble virtues. In this first verse, Amma is referred to by three names: Mātā Amritānandamayi, Jagad Janani, and Mātā Bhavāni. Mātā Amritānandamayi, of course, is the name given to Amma by her disciples. It literally means “the mother who is the embodiment of immortal bliss.” Mrtu means “death,” and a-mrta, therefore, means “deathless.” Amma’s name points not only to her true nature, but also to the true nature of us all. The only difference being that Amma is fully aware of being immortal bliss, whereas the majority of mankind either believes his nature to be just the opposite—one of suffering and mortality—or, at best, only has an intellectual understanding of his true nature. Mātā means mother. Amma believes that the only thing that can truly help today’s world—both in terms of providing a proper role model and of bestowing the love and compassion for which people are starving—is a Mother. Thus, for the benefit of the world, Amma has assumed the bhāva [mode, feeling, role] of the Divine Mother. We can also look at Amma’s name as pointing to the fact that only through following the teachings of a Satguru like Amma is it possible for a disciple to awaken to his true nature; thus for the disciple the guru is “the mother” of immortal bliss. Jagad Janani means “mother of the world.” This can be looked at in two different ways. First, as Amma has chosen to assume the bhāva of a mother, she therefore sees every person, plant and animal in creation as her child. Just as an ordinary mother lives to love and nurture her biological children, so too Amma is concerned with the welfare of society at large. From another perspective, Brahman, in its conditioned form, is considered both the intelligent and material cause—”the mother”—of the universe. Prostrations to the cause of auspiciousness, the Mother, Amritānandamayi. In this verse, prostrations are offered to jana mana nija sukha-dāyini mātā: “the mother who bestows eternal happiness upon mankind.” Happiness is man’s true nature—not the limited happiness that comes and goes with the attainments and losses of life, but the immortal bliss born out the sense of completeness that comes from realising our oneness with the Divine. As Amma is guiding her disciples and devotees towards this realisation, the song says that she is bestowing eternal happiness upon them. Mangala kārini means “she who causes auspiciousness.” A mahātma like Amma is said to be a wish-fulfilling tree, one who can obtain for his devotees any boons they desire. Also, when one becomes a devotee of a mahātma, the mahātma takes upon himself much of the devotee’s negative karma, reducing his suffering. And serving a mahātma brings not only mental refinement but also material prosperity. How many devotees tell stories of Amma helping them gain employment, get promotions, arrange marriages, bringing children and grandchildren, etc. [The one explained in all the Āgamas, Nigamas and other scriptures, Amritānandamayi. Prostrations to the mother who completely destroys all sorrows, Amritānandamayi. In this ārati, Nigama means śruti, “that which is heard,” the Vedas, the eternal scriptural mantras that were revealed to the Rishis in their meditations millennia ago. These mantras are said to have originated with God himself and have been handed down since through an unbroken succession of gurus and disciples. These can be further divided into two sections—one dealing with rituals and one dealing with knowledge of the Absolute. Āgama in this ārati means smrti, the scriptures written by Rishis in order to elaborate on the sruti. (Examples include the 18 major purānas—Vishnu Purāna, Srīmad Bhagavatam, etc.—and itihāsas—Rāmāyana and Mahābhārata, the latter of which includes the Bhagavad Gīta). Amma is then referred to as nikhila-āmaya-hara janani, “the mother who completely destroys suffering.” In spirituality there is only one source of suffering: the disease of ignorance—ignorance of the fact that our true nature is the eternal, non-dual blissful consciousness that pervades all creation. Though the disease is one, it has many symptoms, a series of delusions, the sum total of which can be called samsāra. When one is ignorant of his true nature, the door is left wide open for the first delusion: “I am the body, the mind and intellect.” When one believes himself to be this three-fold contraption, he fails to experience his innate happiness, which awakens the desire in him to attain happiness from the objects of the world. Engaging in activities to obtain this happiness, the delusion “I am the doer” also manifests. Once one believes himself to be the doer, he also believes himself to be the enjoyer/sufferer of the fruits of his actions. This leads only to sorrow—the pain of the struggle to obtain the objects, the pain of the struggle to maintain objects and the pain that comes after their inevitable loss. Thus a viscous cycle of ignorance-desire-action has been created. And until one stops and looks back to their Self for happiness, one will never escape. The only cure for this cyclical disease is the medicine of knowledge, and the only doctor who can administer it correctly is the Guru. Once the disease is cured, all the symptoms go away. Removing our suffering is Amma’s sole reason for taking birth. Teaching the world about the nature of the world and the mind, Amma is leading mankind from a life steeped in misery to one of peace and happiness. And in Amma’s presence, we get a taste of true happiness. Due to her grace, we are able to temporarily forget about our sorrows and experience the bliss the overflows from her. [The mother who rains forth love, which is of the nature of immortality, Amritānandamayi. The mother who bestows love and devotion, Amrtānandamayi. Here, Amma is said to be “the mother who rains forth love, which is of the essence of immortality.” Amma is also said to be “the mother who bestows prema [divine, unconditional love] and bhakti [devotion].” The idea is that love and devotion are awakened by Amma herself. Part of Amma’s greatness is that she does not reserve herself for uttama adhikaris [top disciples] only. She is available to one and all. As such, she pulls people up from an utterly worldly existence and puts them on the path to realizing the Self. How many stories are there of people whom had no interest in spiritual life, but then after receiving Amma’s darshan dedicated their life to imbibing her teachings and selflessly serving the world? Out of her compassion, Amma plants the seed of bhakti within those who come to her, waters them and brings them to full flower. [The bestower of mental and sense control, the cause of the dissolution of the mind, Amritānandamayi. Devi, please always dwell in my heart, Amrtānandamayi. Just as Amma cultivates bhakti and prema in her devotees, she also helps them to acquire other qualifications that the scriptures say a disciple needs. Though the song only mentions śama and dama, we can take these two as representative of the entire sādhana catushtayam, the four-fold qualifications one needs to be an ideal student of a Guru. Śama means mental mastery—a peaceful, poised, tranquil and stress-free mind. Dama is control over the sense organs—the eyes, the ears, the skin, the tongue and the nose. One must be able to intelligently choose what his senses take in and what they turn away from. The sense organs are the gateways connecting our mind with the outside world. Nothing potentially disturbing should be allowed to enter the mind of a spiritual aspirant, particularly in the early stages of his spiritual practices. Amma is also called mana-laya-kārini: “the cause of mental dissolution.” In reality, the mind is not the sentient entity that we believe it to be. 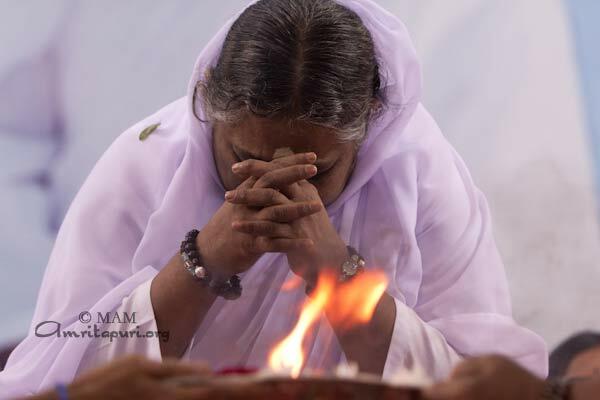 As Amma says, “It is nothing but a flow of thoughts.” When one gets concentration in meditation, the flow stops and one experiences what is known as mana-laya, a temporary dissolution of the mind. At times like these we will get a taste of the bliss that is our true nature. A mahātma’s mind is so peaceful that the peace overflows, as it were, and pervades the surrounding area. Thus many find it very easy to attain deep meditation in their presence. The ārati then requests Amma to live in our hearts. Amma herself says, “I have no particular place to dwell; I reside in your heart.” Though the pure consciousness that is our true nature is in fact all-pervading, while we are living in this body, our particular plug-point, as it were, is in the heart or mind. 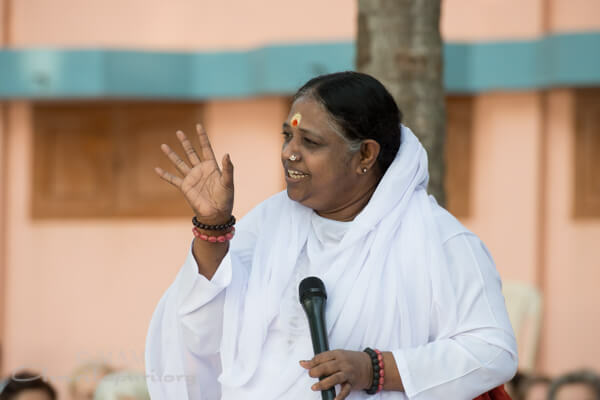 Thus the scriptures say that God, or consciousness, is “realised in the heart.” This can also be taken as a request that Amma never allow us to feel separate from her, and that we become so steeped in her teachings of dharma, love, compassion and selflessness that they inform our every thought, word and deed. [The one whose heart’s eternal desire is to uplift the fallen. The goddess who resides in the state of a paramahamsa, Amritānandamayi. For the sake of mankind Amma has taken the self-imposed desire of uplifting those suffering materially and spiritually. Unlike the desires of man, which enslave him, the desires of a mahatma are self-chosen. In truth, mahātmas like Amma have nothing to attain, so established they are in their fundamental oneness with the Absolute. Yet they chose to act for the benefit of the world. As Śrī Krishna says to Arjuna in the Bhagavad-Gīta: “In all the three worlds, I have nothing to attain, but still I perform actions for the benefit of the world.” From the pinnacle of ultimate knowledge where the mahātmas revel, it can be said that this world is an illusion and does not even exist. Yet out of their infinite compassion, realized ones like Amma come down to our level in order to lift us up to their height. This can also be looked at from the perspective of dharma. Whenever mankind becomes mired in selfishness and unrighteousness, a mahātma like Amma takes birth in order to set the world back on course. Śrī Krishna says as much to Arjuna the Gīta. 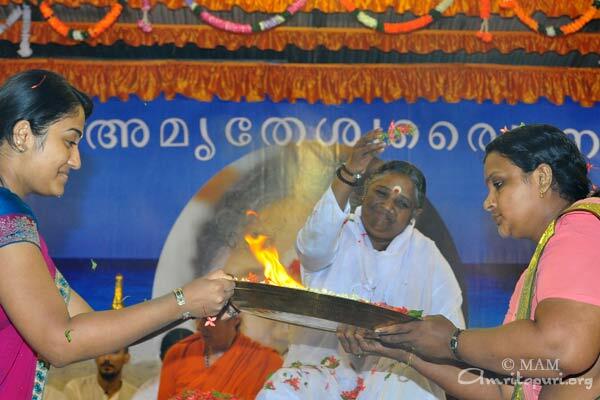 In fact, Amma’s whole life is dedicated to lifting up those whose happiness has fallen. How many tears has Amma wiped over the years! Her darshan itself is only a manifestation of her desire to make others happy. Amma is then said to reside in the state of a paramahamsa. Another name for a mahātma, paramahamsa literally means “supreme swan.” The meaning is taken from the myth that swans have the ability extract only the milk from a mixture of milk and water. Similarly, a mahātma is one who has the supreme discrimination to be able to extract the essential nature of the world, Brahman, from the unessential, the eternally shifting and ultimately pointless names and forms. [O mother who puts a stop to the cycle of birth and death, Amritanāndamayi. O Mother, may you who protects those who seek refuge, be victorious, Amritānandamayi. Here Amma is proclaimed as jani marana nivārini: “the one who puts an end to the cycle of birth and death.” The scriptures point out that the cycle of ignorance-desire-action is, in fact, not limited to this life alone, but extends to other lives as well, leading to a continuum of birth and death. When we attain a desired object in our attempts for happiness, the attainment temporarily stills our agitated mind, resulting in the feeling of joy. But it is short-lived and is soon covered up again with the agitations caused by new desires. We are left only with its memory. However, the mind wants that tiny bit of joy back, and so we again strive to attain that object, and thus an infinite chain is created. Amma and the scriptures say that the desires that remain with us at the time of our death dictate our next birth. This leads to a seemingly endless cycle of birth and death. Only when we surrender at the feet of a Satguru will this cycle be broken. The Satguru destroys our ignorance of our true nature with knowledge. We then come to know that we are ever complete and full, and stop looking for happiness in the outside world. Thus the vāsanas, or tendencies, accumulated over lifetimes of seeking (and seeming to acquire) happiness from the outside world, are finally burnt away. They become like fried seeds, unable to sprout forth into future births. O blessed goddess who is established in sahaja samādhi, Amritānandamayi. In this final verse, it is said that Amma is worshipped by the gods themselves. She is also referred to as Jagadamba, “the mother of all creation, and said to reside in the state of sahaja samādhi. The scriptures say that if one acquires enough merit through various actions it is possible to be born as a deva, or demigod, in their next life. Sura is another name for deva. Spiritual aspirants are not supposed to be interested in such attainments as, however subtle and high such attainments may seem to us, they still fall within the scope of unreality, and pale in comparison to the bliss of the Self. They are also temporary. When the merit that transformed us into the god is used up, we have to come back to the earthly plane. When a prime minister or a president’s term in office comes to an end, he often suffers from depression. Imagine then the depression that would result from losing your term as a divine being with all the heavenly pleasures at your disposal! The gods of such worlds know that the attainment of a Satguru, who has realised his True Nature, is in fact much higher than theirs; therefore they are said to worship Amma. The gods worship Amma because she is established in sahaja-samādhi. There are several different types of samādhi mentioned in the scriptures, and no other term has caused more confusion in the minds of spiritual aspirants. Samādhi is a term from the yoga scriptures that has to do with meditation. It is the eighth step of Sage Patanjali’s eight-limbed system of yoga, and it means absorption in meditation. The main two types of samādhi are nirvikalpa and savikalpa (without and with division). In nirvikalpa samadhi, one becomes completely absorbed in the object of meditation, verily becoming one with it. All distinction between mediator and object of meditation fall away. In savikalpaka samādhi, a division remains wherein the meditator still considers himself as separate from the object of meditation. These mental states may last for a few minutes, a few hours or a few days. Sahaja samādhi means total, natural and effortless absorption in the Supreme Truth that everything inside and out is nothing but Brahman. One who abides in sahaja samādhi may “demonstrate” nirvikalpa or savikalpa samādhi to inspire his disciples in their meditation practices. But whether such a one is meditating, walking, talking, eating or sleeping, the Supreme Truth that they are “amrtānandamaya” never leaves them. As Amma says, “One who is established in this state sees the Divine principle in everything. Everywhere he perceives only pure consciousness, free from the taint of maya. Just as a sculptor sees in a stone only the image that can be chiselled from it, mahātmas see in everything only the all-pervading Divinity.” Sahaja samādhi is verily Self-realisation, and this is the samādhi in which Amma ever abides.